Libby is a very intelligent, bossy, and intense dog. She excels at enforcing the rules of her owner. She is a nurturing guardian to her pack babies and an avid hunter to critters her owner deems as prey. She is faithful to her charges and her territory. She is gentle enough to lick rabbit kits and bold enough to move a full grown bull. 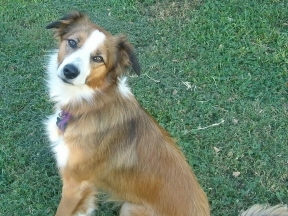 She has had little herding training, but has been known to come to the aid of her owner without instruction. In herding, she has shown that she is capable of herding without malice but will use her teeth if necessary, gripping appropriately. She loves to tree squirrels, is a wonderful mouser, kills opossums and has eradicated the moles in her yard. Libby is not a soft dog, but is obedient. She generally gets along with other dogs, but will insist on being the boss.